Lithographer: Needham, Jonathan (fl.1850-1874) O'Brien, Charles D.C.
Lithograph by Jonathan Needham (fl.1850-1874) after Charles D.C. O'Brien of the 'Town and lake of Kandy' in Sri Lanka, dated 1st January 1864. This print forms plate 1 of 'A series of fifteen Views of Ceylon illustrative of Sir J.E. Tennent's work, from sketches made on the spot by Capt C. O'Brien, late Assistant Surveyor General, Ceylon' London, 1864. 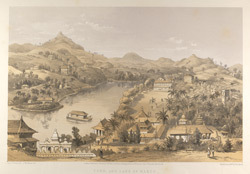 Part of the text accompany this image reads, "Our view is taken from the hill, a little below 'Lady Horton's Walk', looking down on the lake, the Malagawa Temple, the Audience Hall (at present used as the district Court-House), above which, surmounted by lofty cocoa-nuts, appear the tombs of the Kings of Kandy; whilst in the immediate foreground, is a terrace, which leads to that part of the Palace, now the residence of the principal civil officer of the province. A carriage road runs around the margin of the lake, the resort of the European Community for their 'evening drive', and on the town side is a neatly-kept walk, shaded with trees, where the nurses and children congregate, protected from the carriages, to enjoy the cool breeze which is constantly blowing on the surface of the lake. On the opposite side from the town are the monasteries of the priests, and above them, the residences of the principal civilians and merchants."